Layer cake, jelly roll, and charm quilts are among the most popular free quilt patterns around. The pre-cut fabric scales back the time it takes to make a quilt and allows a quilter to make complex designs without a complex process. More importantly, making an easy quilt using pre-cut fabric is a great way to learn new quilting and sewing techniques, since you can focus on piecing and designing without the added stress of measuring and cutting fabric. This book of free jelly roll quilt patterns includes quilts for all occasions. Make an easy lap quilt pattern for your couch or chair that will brighten up any sitting room, or follow your favorite baby quilt tutorial (if you can even pick just one) to steal the show at a baby shower. Or, if you're ready for warm weather, sew an easy jelly roll race quilt pattern to make a picnic blanket. Whether you're sewing a baby quilt pattern, a quilted sofa throw, or a DIY picnic blanket, How to Make a Jelly Roll Quilt: 9 Jelly Roll Quilt Patterns has a project for you! Download How to Make a Jelly Roll Quilt: 9 Jelly Roll Quilt Patterns for free today! Check out these other amazing titles from the FaveQuilts free eBook library! Never underestimate the difference that the right quilt can have on a room. Throws and lap quilts can tie a room's general decor together or brighten the atmosphere. Not to mention the fact that they're great for snuggling when the winter cold sets in. This eBook includes lap and throw quilt patterns for all seasons—and all budgets. Patterns like the Four Hour Lasagna Quilt (p.5) are perfect for beginners or expert quilters strapped for time. 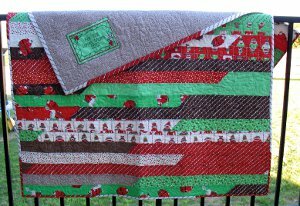 If you're looking for something a little more complicated, try the Boxing Day Jelly Roll Quilt (p.10), which combines strips and squares for a truly beautiful design. This quilt uses soft, muted colord to create a calming but beautiful quilt which won't look at all out of place over the back of a couch or hanging on a rocking chair. Choose the colors that appeal to you and make this beautiful, geometric design. To make a jelly roll race quilt pattern, one of the most popular free quilt patterns using jelly rolls, look no farther than the aptly title Jelly Roll Race Quilt (p.17), which takes barely any time at all and is guaranteed to light up a room with its energy and bold color. This quilt is wonderful for its variability — make a quilt that is bright and cheerful or use darker, deeper shades for when the season changes. Make one for every type of weather! Ah, summer. There's no feeling quilt like the first few weeks of warm weather, when winter seems to just melt away. Use the still-brisk days of early spring to sew an easy DIY picnic blanket in preparation for lazy summer afternoons at the park! The summer quilt patterns in How to Make a Jelly Roll Quilt: 9 Jelly Roll Quilt Patterns are the perfect DIY picnic blankets: light but sturdy, quick, and of course easy quilt patterns that you can take anywhere. 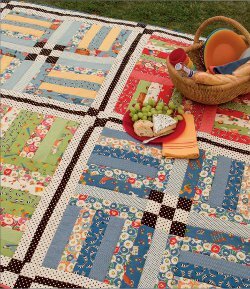 Quilts like the Rail Fence Picnic Quilt (p. 19) make use of the rail fence pattern to create a complex-looking but easy to make quilt pattern that will have you reaching for a picnic basket. 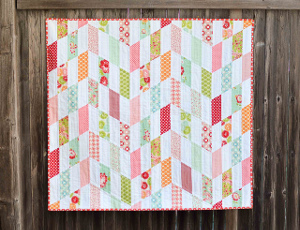 If you're out of jelly rolls, but love the look and design, try the Speedy Strips Layer Cake Race Quilt (p.27), which mimics the jelly roll design using leftover scraps. Of course, you can also use actual jelly rolls to make the pattern, and save yourself the trouble of cutting strips. This race quilt can be put together in just one afternoon, and will be perfect for any Fourth of July celebrations you may be planning. the great thing about race quilts is the sense of movement and energy that you get from the design, perfect for family barbeques or summer evenings! Whether you decide to use a jelly roll or cut your own strips, at the end of the day you'll have a beautiful picnic blanket and a plan for your next free weekend! One of the most meaningful jelly roll quilts you can make is a baby quilt. These quilts are the kind of gifts that both fulfil practical needs and hold enormous sentimental value. Imagine it: years from now, the little child you sewed an easy baby quilt for will still have that gift as a precious keepsake, or will have passed it on to a younger sibling or family member. What better gift is there? Beautiful, fun quilts like the Striped Chevrons Baby Quilt Tutorial (p.30) and the Sew Stitchy Squares Quilt (p.34) are the perfect DIY baby blankets to make.They are incredibly easy to put together and also provide visual stimulation for infants to help them as they develop. Even though both of these quilts make use of varied colors and patterns, they both manage to do so without being too busy. These are the types of quilts which are perfect for a baby's crib, but won't look out of place on the floor in a playroom or sitting room. The Sew Stitchy Squares Quilt also makes use of a charm pack, so pick and choose your color scheme wisely! Not to mention that these gorgeous jelly roll quilt patterns will look fabulous no matter where you put them. You may even convert one or two into a tapestry after your little one has outgrown it. Whatever you decide to do, you can be sure that these easy baby quilt patterns will last much longer than one lifetime. Jelly rolls are a staple in the stash of any quilter worth his or her salt. They are perfect for days when you want to whip up a quick race quilt or do not have the time (or disposition!) to spend a lot of time cutting out strips.The patterns in How to Make a Jelly Roll Quilt: 9 Jelly Roll Quilt Patterns are perfect for any number of projects, from baby quilts to home decor. You can make a quilt that will be warm and cozy, great for snuggling under while you watch TV on the couch, or a light but sturdy picnic blanket for the beautiful days of summer. Using jelly rolls is a great way to keep quilt construction straightforward and easy. So get those strips ready and let's make a beautiful quilt! FaveQuilts eBooks are free, downloadable quilt pattern and tutorial collections. These eBooks are PDF documents that can be downloaded off our website, saved to your computer, and/or printed out for easy reference while quilting. If you are having trouble downloading our free eBooks, visit our FAQ page here: How to Download Our eBooks. If you enjoyed this free eBook, you won't want to miss any of our downloadable quilt pattern collections. You can browse our entire library of free eBooks here. Five weekly e-mails with free quilt patterns, tips, collection pages, videos and more. Put those jelly rolls to good use by downloading our latest eBook! You can also subscribe to our Piecing It Together newsletter, and you will receive new free quilt patterns in your e-mail inbox every week! Join the FaveQuilts.com quilting community and gain access to hundreds of free quilt patterns and connect with quilters all over the country. Download this free eBook and check out FaveQuilts.com for tons of quilting inspiration! Great collection. Jelly rolls are the best! My photo from my comment didn't upload so here's another attempt to share. The first quilt I made was a jelly roll race for my great-grandson. It came out great so I made a couple more. A few years down the quilting path I came back to this fun pattern to make a quickie quilt for an ailing friend. Also came out great. Very reliable pattern and fun to play with too. Do you suggest doing a jelly roll quilt to start with? I have never quilted and I am trying to get the courage up to start but do not want to get frustrated and quit. I have been searching this site to find a good starting quilt. I love the look you get from these jelly rolls because it takes the guess work out of figuring out your own colors. The tutorial seems to be good. Which would you start with if your first quilt was today? Thanks. Any precut would be great to use for your first quilt. The reason I say that is you know your material is cut accurately. All you need to worry about is a scant quarter inch seam allowance. I'd say go for it! I was wondering if you could share the maker and name or even a link to purchase the Jelly Roll you used to make the chevron baby quilt? It is beautiful and I can't seem to find one similar. Hi sbulla 9746824, if you would like to know the specific jelly roll used for the chevron baby quilt, I would recommend reaching out to the blogger directly on her blog. The blog for that project is Kitchen Table Quilting. Hope that helps! Thank you for this helpful eBook. You provide so many wonderful jelly roll quilt patterns. How many jelly rolls needed queen size quilt using the Batik quilt pattern?